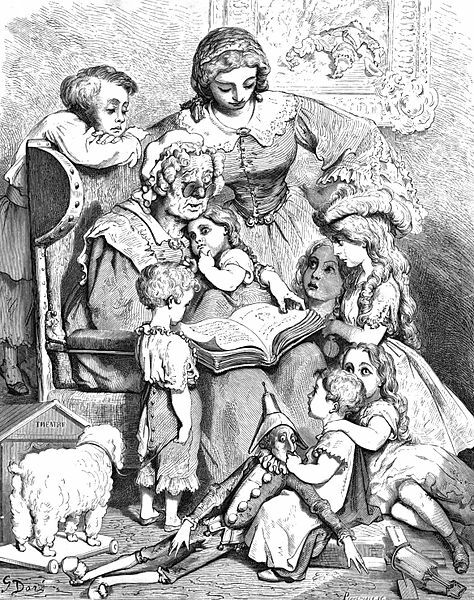 Mother Goose reading fairy tales. Illustration by Gustave Doré (1866). Children’s books are very much a genre of their own–or rather multiple genres, since they can be realist or literary fiction, mysteries, fantasy, history, or (almost) any other adult genre, plus the different age groups: chapter books (ages 6-10), middle grade (ages 8-12), upper middle grade (ages 10-14), and young adult (ages 12-18). The literary conventions in children’s literature are very different in many ways from adult fiction, both because of the younger audience (which requires simpler language and shorter lengths), and because the marketing is more geared to parents and schools, with their distinct views of literature. I’ve been taking a closer look at children’s literature because I’m planning to write a middle grade fantasy novel for Camp NaNoWriMo in July (more on that later). In preparation for this, I’m reading through a number of classic children’s fantasy novels, some of which I’ve read, and some I haven’t, in order to get a feel for the genre. I will post my observations from these books as I read them in the coming weeks. This entry was posted in Reading, Writing and tagged camp nanowrimo, children's books, children's fantasy, middle grade. Bookmark the permalink. I took a few children lit classes in college and drama for the young. It’s true that children genre exist in a world of there on. And people are trained to think and relate to kids on a literary level.